Mother’s Day is tomorrow and I wish all of the mothers a very happy day spent with those you love. I am so blessed to have my mother still with us. Last year on Mother’s Day, I wrote about the fun times that my children and I had growing up with her. For these memories I will be forever grateful. Mother’s Day is a time to recognize and celebrate the hard work and affection that goes into being a mom. What better way to honor the special woman in your life than with something homemade that’s as elegant and lovely as she is? That was the idea when we developed the first ever Queen Cake for Louisiana Cookin’ magazine. Each year in our May/June issue, Louisiana Cookin’ will showcase an updated version, each more resplendent than the last. Preheat oven to 350°. Spray 2 (9-inch) round cake pans with baking spray with flour. In a large bowl, beat butter and sugar with a mixer at medium speed until fluffy, 3 to 4 minutes. Add eggs, one at a time, beating well after each addition. Beat in vanilla. In a small bowl, whisk together flour, baking powder, baking soda, and salt. Gradually add flour mixture to butter mixture alternately with buttermilk, beginning and ending with flour mixture, beating just until combined after each addition. Stir in sour cream. Spoon batter into prepared pans. Bake until a wooden pick inserted in center comes out clean, 23 to 27 minutes. Let cool in pans for 10 minutes. Remove from pans, and let cool completely on wire racks. Using a serrated knife, cut layers in half horizontally. 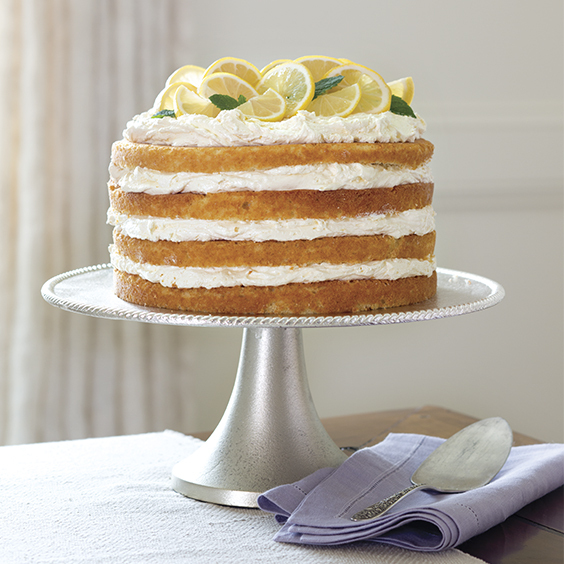 Spread Lemon Cream Filling between layers and on top of cake. Garnish with lemon slices and mint, if desired. Cover and refrigerate for up to 3 days. In a large bowl, beat cream with a mixer at medium speed until soft peaks form. Gradually add confectioners’ sugar, beating until combined. Spoon lemon curd into a medium bowl. Add 1 cup whipped cream, whisking until smooth. Add lemon curd mixture to remaining whipped cream, gently whisking until combined. Use immediately, or cover and refrigerate for up to 3 days. Happy Mother’s Day Phyllis! I lost my Mom in 1988 and I used to call her “my Queen” so reading the title “Queen Cake” was so special to me! My sister in law and my niece are exceptional cake bakers! Their cakes look beautiful and are delicious as well! I so enjoy reading your Ribbon entries and delight in your publications, especially TeaTime Magazine which is my favorite! Happy Mothers Day to all of us! What a blessing was bestowed upon us. This cake sounds wonderful, my own mother was a fabulous baker, however I am not, but will try! Thank you for all your inspirations. Used this site with the cake recipe to email a Happy Mother’s Day wish to many of my friends who are mothers! Thank You!! Have a really nice day tomorrow with your family. I love to read about your love for your mother and how you appreciate her so much. Thats what every mother would want and hope for. Looking forward to every Ribbon from you and I always read what all the people write to you in return. Mothers Day Greetings from The Netherlands to all of your readers and Moms! I don’t comment very often, but thank for the scrumshious cake recipe. Have a Happy Mother’s day to you and your mom, and all the other moms in your family! Have a great day! Happy Mother’s Day to you Phyllis and to all your readers! And thank you for that cake recipe. You can do so much with it. Mothers are definitely special and deserve any and all accolades! My own mother, who is a passionate gardener, turned 80 on May 5th. Her favorite flower is the Peony, so to honor her, I made a gum paste peony and decorated a Walnut Mocha Torte for her birthday…her favorite nut is the walnut. It was a special celebration and she graciously accepted the attention (something she shies away from). Happy Mothers Day to you and thank you very much for this wonderful recipe. Fortunately, I cook a bit better than I sew…..
Over the Fourth of July we gather family and friends at “the lake” and decorate cabins and boats for the celebration!! After the “Parade of Boats” we settle in for a fun BBQ and wait for the fire works to begin. I know what my dessert will be this year! Your amazing cake!!!! I will decorate with red, white and blue “little flags”!! Thank you again for your great blogs! !